Bipolar and generalized anxiety disorder. Hello again. I forgot about you (almost). It’s been a while since we’ve been around one another, but I’m experiencing you once again. You see that Semicolon Tattoo? That stands for mental health awareness. Suicide prevention. All the things that are important to me because not only do I deal with it, Joey (my brother) committed suicide. 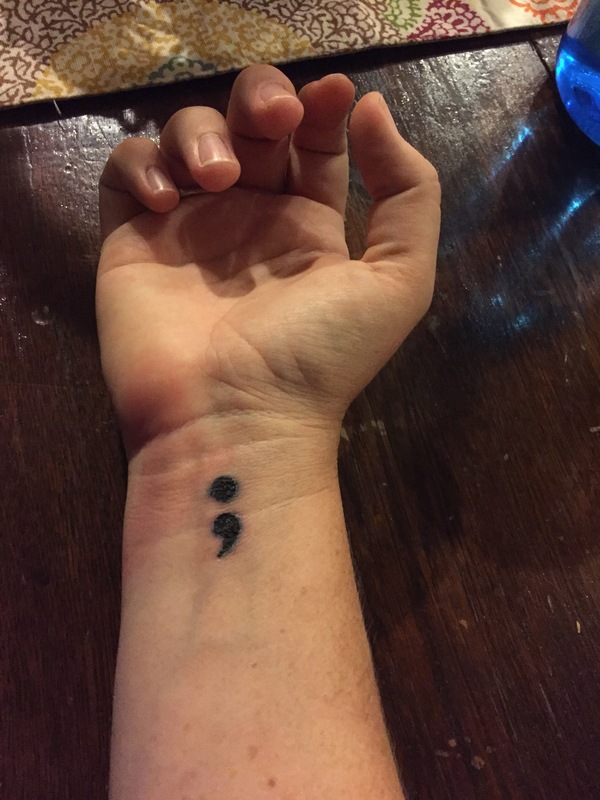 Project Semicolon. This week, I had a reminder of why this is so important to me. This past month has been so good for me. I started the 21 day fix. Kept up with it (mostly) for 4 whole weeks! Hiked 3.5-8 miles per day. Did the 21 day fix workouts. Ate clean. Felt so good. Monday, I woke up and did my hike and workout. Then, all I could do was lie down. I felt an ache in my body that I hadn’t felt in a while. My eyes were so tired that I couldn’t keep them open. The boys were here, and all I could do for them was put them in front of the t.v. I made myself eat, but I struggled to eat. I tried to take naps all day, but couldn’t fall asleep. I was feeling my old friend, depression, knock at the door. Then the same thing happened the next day, and the next day. And now I’m on day four and I haven’t worked out in a few days and I haven’t been eating. I’ve only taken a couple showers this week. I haven’t left my bed or my computer. The motivation that I had for working out is completely gone, as well as, the motivation I had for eating so well. Actually, motivation to eat at all is pretty much gone. I’ve had a salad, cottage cheese, and half a shake today. And it’s almost 5:00. I also have a pile of laundry and my house is disgusting. Which is abnormal for me. This time is somewhat different. I’m here writing about it. I don’t feel hopeless. Or suicidal. Or like my world is falling apart. I just feel no desire, no motivation for anything. I feel a struggle to get out of bed. I have slept a lot. Boy am I glad my kids are at my parents’. I pray that this ends soon and I’m back to my old self. In the meantime, I’m starting to realize some things. Depression has been gone for a long time. I haven’t struggled with it since last November (really). But, it’s still a possibility with bipolar. Remember how I was hiking every single day and doing the fix workouts with no problem? That’s called hypomania. I had a crazy amount of energy and was using it wisely at least. But after that comes the crash. Hopefully this crash doesn’t last as long. I already feel like I’m on the upswing. But, these times still happen. I can’t medicate them away because medication isn’t a cure. At least this time, I will not end up in the hospital! I’m so thankful for friends. I have been able to talk through this entire thing. Friends have left me a box of goodies. I have been told that I’m loved and they are here. Part of my struggle has been with school. I feel that I am still not healthy enough to homeschool all of the kids. It takes a lot of something I don’t feel that I have. I don’t know that it’s for the best. I have quit teaching jobs 4 times because of my bipolar and anxiety, and I’ve ended up in the hospital twice. I need to do what is best for all of us. We’re considering a school that is about 30 minutes away. It’s a tiny charter school with an exemplary rating. Our friends’ kids will be going there. I talked to the kids about it and immediately Karis started crying. She wants to homeschool so badly. The boys were so excited about the possibility. At this point Robert and I are thinking that I can handle just homeschooling Karis and that it would be best to go ahead and put the boys in school. We’ll see what happens. I will be checking the school out next week. We’ll make our decision after we’ve seen the school and can talk with the superintendent in person. I’m feeling okay. Like this will be short-lived, thankfully. I’m praying that it doesn’t get worse before it gets better. In the meantime, I focus on survival and let people love on me. I’m so thankful to live in this community.